EM® use in commercial aquaculture farm on Oahu, Hawaii. Wong’s Products LLC. 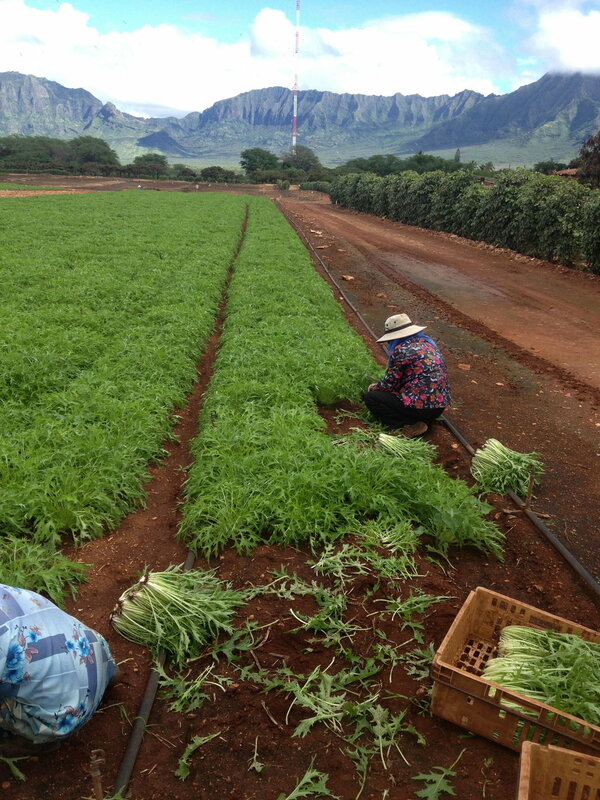 started to EM® on his taro fields in Nov. 2013 due to disease outbreak. He then took over the commercial prawn production…. Fukuda Seed Store, a long established seed and garden shop in Kalihi is celebrating the 105th anniversary of their business this year. This month, the store moved into a new location in the same building. HAWAII HOME & REMODLING magazine featured “Sprout Into Summer” an article by Tyler Shiroma with photo credit : Aaron Yoshino introducing Effective Microorganisms®, EM® Bokashi, and free seminars at our EM HAWAII office located inside Na Lama Kukui on Nimitz Hwy. HAWAII HOME & REMODLING magazine featured our “Powerful Probiotic for Your Home Garden” and introduced our EM HAWAII office inside the Na Lama Kukui Building in September 2016 see featured article by Stephanie Silverstein with photo credit: Elyse & Matt Mallams. Successful sold out screening of the documentary film, “SOSEI-Revival” and Dr. Yoshimi Tanaka’s presentation on “How to live without illness”, was held at the Doris Duke Theatre on Sunday, November 6, 2016. Lanikai Elementary School student advances to the State Science Fair with EM•1®Bokashi project. Kainoa wanted to test the value of EM-Bokashi used as a solo soil amendment for his science fair project. We had accumulated four Blasters full so there was plenty bokashi available for field trials. Fusarium wilt of lettuce is caused by a fungus. It causes lettuce to wilt, leaves turn yellow, develop tip burn and die. With weekly foliar applications of EM•1® throughout his farm, the growth and production of other vegetables crops could be seen. Owen Kaneshiro Farms incorporating EM•1® on a weekly basis since January 2013. Composting with Kids workshop 2 held at the Urban Garden Center. 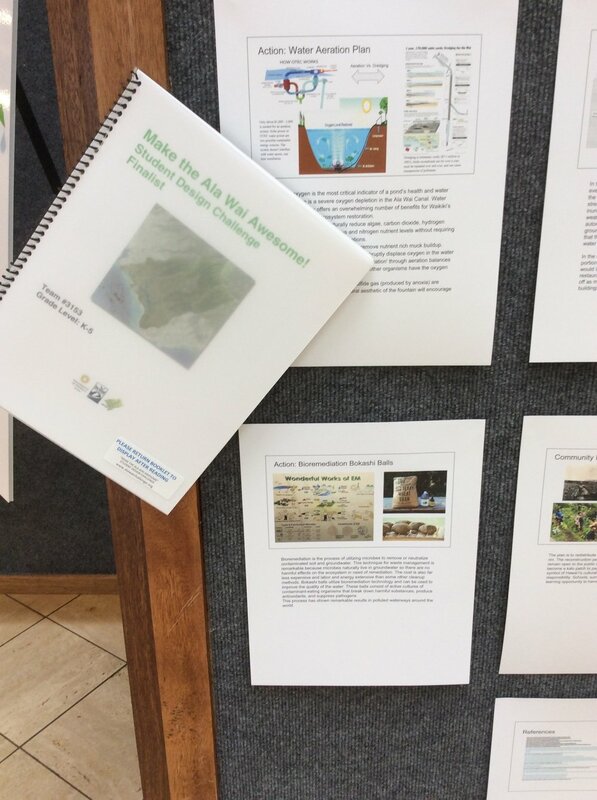 Kokua Hawaii Foundation offered a hands on workshops for their Aina in School teachers and docents, in conjunction with the Oahu Master Gardeners. "Composting With Kids" workshop 3 held at the Urban Garden Center. Pearl City High School recycling all their cafeteria food waste from the beginning of this School year. 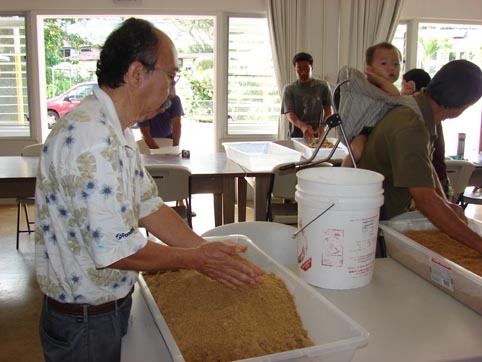 Mokichi Okada Association (MOA) of Hawaii, participated in EM® Bokashi making workshop with their members. Beautiful Sunny day at Hoa Aina O Makaha's Annual Open House. Well attended with families from all over the island. Entertainment, Healthy food stations, Harvesting Activity, etc. Pictures from our last EM® bokashi drying lesson... lots of fun! I'm looking forward to more adventures with EM® bokashi next year!